Uganda has granted asylum to the 15 players from the Eritrea football team and the team doctor who absconded in the country in December during the 2012 Cecafa Tusker Senior Challenge Cup. Apollo David Kazungu, the Commissioner for Refugees in the Office of the Prime Minister in Uganda, said on Monday that the Refugee Eligibility Committee had found the group's claims valid and granted them refugee status. The Eritrean team had been eliminated in the tournament in the early stages after drawing with Zanzibar 0-0, losing 3-2 to Malawi and being beaten 2-0 by Rwanda in their last match on Saturday. Instead of boarding the next plane out of Uganda, 17 players and officials left their Sky Hotel reportedly to go shopping, but only three returned to Asmara. "This is very good news if they have finally been sorted by the relevant authorities. But next time teams should come and play football and return to their countries," said Uganda Football Association's vice-president in charge of youth, Patrick Ogwel. Kazungu explained that two of the players who had applied for asylum returned home, but the rest refused to return because they feared they would be conscripted into military training. He also revealed that although the Eritrean players have been granted asylum, they have not been relocated to the resettlement camp because they prefer to stay around Kampala. Kazungu explained that the Ugandan government's policy is not to force any refugee into the settlement camps, adding that it is acceptable for the Eritreans to stay in an urban setting like Kampala if they can afford to. 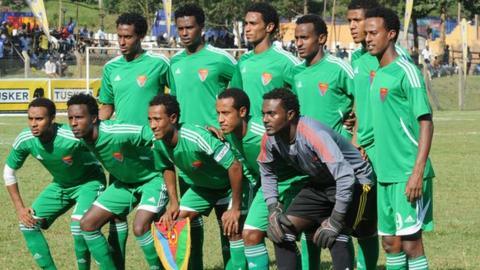 After the 2010 Cecafa tournament in Tanzania, 13 players from Eritrea's team also disappeared and defected. Several of those players have since reappeared in Houston, Texas under a refugee resettlement programme in the United States.